Lauder addresses special EU conference: “Europe is at a turning point - we must work together to fight antisemitism"
BRUSSELS – A World Jewish Congress delegation led by WJC President Ronald S. Lauder, comprising CEO and Executive Vice President Robert Singer and senior WJC security officials, took part Thursday in a special conference at the European Parliament under the banner The Fight Against Antisemitism: A Common Approach to Better Protect Jewish Communities in Europe – from Policy to Action. 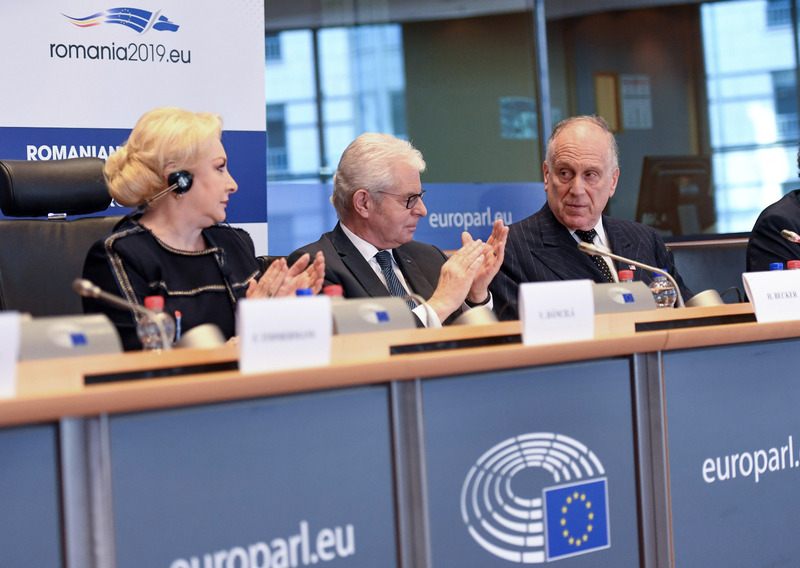 The conference was hosted by Romanian Prime Minister Viorica Dancila, whose country holds the rotating presidency of the European Union and featured high-level remarks by WJC President Lauder and top EU officials. 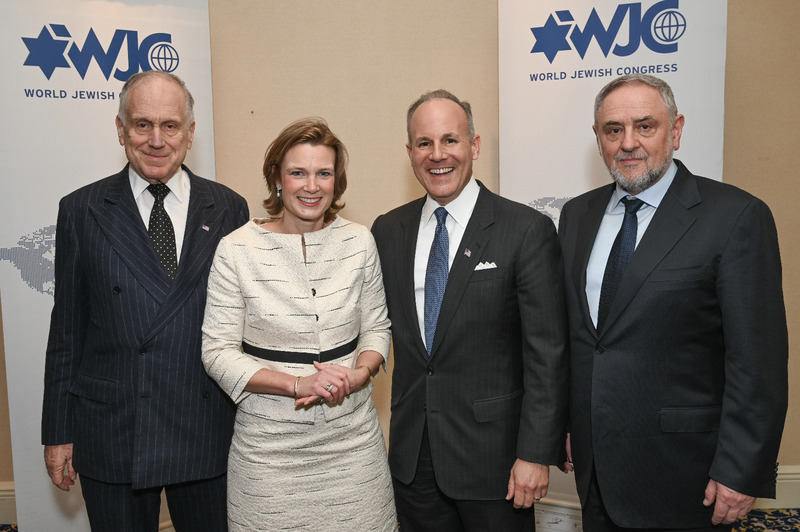 In his address, WJC President Lauder said: “In an age when extremism seriously threatens civilization, when we face global unrest, to pick after Jews or to go after Jews is not just wrong – it is dangerous for all Europeans…. The reason we are here today is the resurgence of the age-old hatred of Jews here in Europe, once again. Is this just another cycle? Did Europe give the Jewish people a reprieve after the world was so horrified by those photographs of the skeletal bodies at Dachau and Bergen Belsen and Auschwitz? There are important lessons that we need to remember from the past, because I believe there are direct links to the growing antisemitism that we see today,” Lauder said. The Holocaust, Lauder noted, was not just German – it was a European event. “Practically every single country on this continent, with just a few exceptions, helped the Germans round up their Jewish citizens, or conveniently looked the other way, and that is just as dangerous… All of you here in this room are leaders. We must lead by example… and we must never show indifference.” In the UN today, bias against the world’s only Jewish state runs rampant, Lauder said, and across Europe antisemites and neo-Nazis are gaining steam without repercussion. “This is a turning point, right here and right now. Europe has a choice. You have a choice,” Lauder told the European leaders. “We are not your enemy, we never have been. We must work together, all religions, including Muslims, if our Judeo-Christian civilization is going to survive. Antisemitism eventually consumes everyone and everything. We need to form one solid line of defense against today’s evil. We must all work together to stop antisemitism. We must all work together to make Europe once again the center of human advancement. We must do this for our children’s sake. We must do this for the future of Europe. We must do this for the entire world." The conference comes exactly two months after a declaration by the 28 interior ministers of the Council of the European Union calling on member states to take steps to ensure security for Jewish communities, institutions, and citizens, and to emphasize the importance of Holocaust commemoration and education. It also urges EU member states to endorse the International Holocaust Remembrance Alliance’s working definition of antisemitism in the fields of law enforcement, education and training, and implores the European Commission and Europol to pay particular attention to online antisemitism and incitement. The WJC worked closely for many months with the Austrian government authorities and the European institutions, in close coordination with the Austrian Jewish Community and the European Jewish Congress, in developing the declaration’s content. WJC representatives also held over 100 meetings with representatives of EU member states and EU officials and also testified before the EU’s Justice and Home Affairs Council so as to emphasize and explain the critical importance of the declaration’s adoption. Following the conference on Thursday, the WJC delegation hosted a high-level working dinner with top European and Jewish officials, including European Jewish Congress Executive Vice President Raya Kalenova, and special representatives on antisemitism from around the world, among them Coordinator for Combating Antisemitism of the European Commission Katharina von Schnurbein, Ulrich Fritz of the Office of the Commissioner Against Antisemitism Bavaria, Deputy Foreign Minister and National Coordinator for Combating Antisemitism Ministry of Foreign Affairs of Bulgaria Georg Georgiev, and the newly appointed US Special Envoy on Combating Antisemitism Elan Carr, inter alia. This was Carr’s first participation in his new role at an event organized by a Jewish organization.